There are more than enough great restaurants in Taylor, TX to keep you eating new cuisine for weeks! We’re fortunate to have so many great options in our community, but it can make picking a lunch or dinner spot a bit difficult sometimes. Nyle Maxwell CDJR of Taylor is excited to share some of our favorites in this helpful local guide. Let’s eat! Aptly named, Southern Hospitality is a buffet owned by the kindhearted husband and wife duo, Gail and Fred Warren. In fact, when you walk in the door, you’ll probably be greeted by Gail herself. The pair offer up dishes that are “straight-forwardly delicious and affordable home cooking made from scratch.” Meanwhile, you’ll often spot Fred working his magic in the kitchen. Our recommendations? Fried catfish, chicken & dumplings, and the fish po’ boy. Our guide wouldn’t be complete without a Taylor, TX bbq restaurant making the list! Louie Mueller Barbecue claims to be “the best barbecue in Texas,” but we think you should judge for yourself! As far as we’re concerned, they’ve been churning out some of the tastiest bbq Texas has to offer since 1949, and the years they’ve spent honing their craft are evident in the legendary brisket, multiple flavors of ribs, and pit-smoked turkey breast. The best part? They ship their BBQ nationwide! Even if you don’t live here, you can get in on the Louie Mueller goodness. If good old Texas comfort food is what you’re craving, you’ll find it at Lucky Duck Cafe. It’s locally owned, and a great place to bring your family. Their food is made to nourish both body and spirit, and we think you’ll feel pretty great after trying their fried chicken sandwich or the grilled chicken cordon bleu. Before you head back home, head over to Lucky Loo’s Sweet Treats for a scoop of ice cream – they’re located right inside of the Lucky Duck. If you’d like to try a meal with some flare, head over to RiCoco’s. They serve authentic Mexican dishes made from only the freshest ingredients available. For starters, their salsa is made fresh every day, and you can’t go wrong with the bean dip with melted Spanish cheese on top. For an unforgettable meal, try one of the chef’s specialties – the burrito supremo muy Rico! is a popular choice among locals. Looking for something to do after lunch? Check out some of the best parks in Taylor, TX. 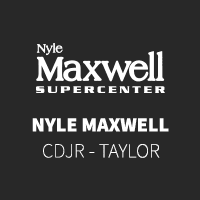 The team at Nyle Maxwell CDJR of Taylor has an abundance of local knowledge we’re excited to share with you, so be sure to check back for more local tips in the future!